Federal Autocat Recycling wants to be number one catalytic converter recycling company. We plan on accomplishing this plain and simple: paying out more to salvage yards and collectors who call upon us. Our industrial division as well welcomes larger spent catalytic conversions and offer significant credit options for the purchase of new ones through our sister company Hypercat ACP. In addition to industrial emissions control catalysts, Federal Autocat Recycling is one of the largest buyers of foil automobile catalytic converters in North America. In the emerging world of diesel emissions control devices, Recycalytics (our sister company) stands alone in supporting manufacturers and fleet managers with resource recovery expertise as well as federally mandated retrofits for all catalysts, filters and other diesel devices, regardless of substrate material or configuration. With over 75 years of cumulative experience in the recycling of PGMs, we will evaluate your catalyst material rapidly and return cash for your scrap. 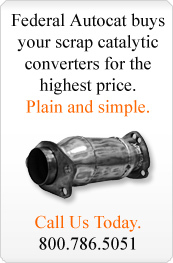 Contact us to learn more about our catalytic converter recycling company.